Over the years I’ve had many reactions to telling people that I’m a dietitian. Usually I get asked lots of questions about foods such as “Are bananas good for you” and “Uh Oh I’m eating chocolate” to “How good is …… (insert the latest “superfood” here)” along with “I’m on the ……. diet”. 1. You must be a vegetarian. I loose count of the number of people who assume I am vegetarian. The best was being refused a taster of a meaty food at a supermarket because the store assistants assumed I was a vegetarian. Bizarre as they knew nothing about me. Apparently I look like a vegetarian. So my question is: “What does a vegetarian look like?” Either I look like I may be anaemic or I look like I’m full of amazing plant protein? Actually I used to be a vegetarian as a teenager and I would be one now if I lived alone and if sausages didn’t exist 😉 We eat meat a few times a week in our house and eat plenty of vegetarian meals too. I do agree that eating plant-based protein is a healthier and more sustainable way to eat, so I would encourage people to eat less meat. 2. No cake for you. I lose countof the number of hilarious occasions when people have bypassed me and not offered me cake/chocolate/sweets thinking that I wouldn’t eat them. Now there are lots of foods I cannot eat as I am wheat intolerant but I do enjoy a treat from time to time, all things in moderation is my mantra. All dietitians like cake, it’s in our code of conduct 😉 in fact at the British Dietetic Association Annual dinner this year the dessert was not a fruit salad… but a chocolate brownie with ice-cream. Cake is a once a week treat in our house. Homemade healthier flapjacks… now that’s a whole different story! 3. You must like diets. As soon as I say that I’m a dietitian people love to talk to me about the lastest diets they are on. However in actual fact I am anti-diet. I literally sigh inside when people start with “Oh great, I’m on the …. diet, you must know all about that” Lets avoid the fad diets and just eat healthily please. 4. You always go for the skinny option. Now I admit, most of the time I do chose the healthier option. I like the 80/20 rule where you eat healthily 80% of the time and allow yourself some more relaxed eating 20% of the time. So although I may not eat that piece of cake and do choose a camomile tea over a latte, it is not always the case. Dietitian’s. Usually very into cooking, food, cake and science. Not that into fads, diets and avoidance. 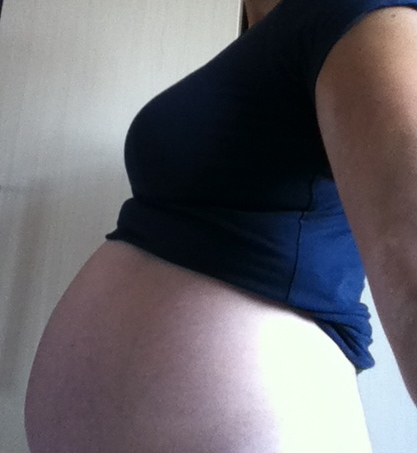 Diet in pregnancy is key. What you eat in that time will influence the growth and development of baby not only whilst it is in your womb but for the rest of it’s life. Research has shown the risk of chronic diseases are influenced this early on by the mums diet. What extra do I need? The body adapts in pregnancy to provide some of the extra needs by either absorbing more from food or by decreasing the amount of nutrients lost. It’s a very clever business. For example non-harm iron (from plant sources) is absorbed better and less iron is lost as menstruation does not occur in pregnancy. For some nutrients such as calcium the increased amount needed for the baby is met extra calcium being released from the mum’s bones. Folate – extra 400µg per day for first 12 weeks of pregnancy and during conception. Vitamin A – do not go overboard, 100µg/day only, some vitamin supplements will be unsuitable in pregnancy as they contain too much Vitamin A. Iron – eat plenty of iron rich foods. Good sources are red meat, green leafy veggies, dried fruit, beans and pulses, nuts, seeds and fortified breakfast cereals. Omega 3’s – eat 1 x 140g portion of oily fish per week – salmon, fresh tuna, haddock, trout, mackerel, pilchards, kippers and sardines. 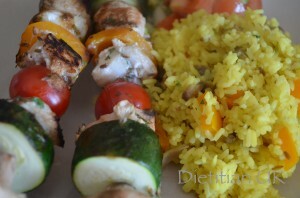 Fish Kebabs with cumin scented rice and avocado salsa. So I may have surpassed myself. This was AMAZING. We went to a BBQ on Sunday and these are what I had planned to make and then I ran out of time. The idea had been pinging around in my head for a few days, today it unravelled turning into a salsa and tasty rice too. If, like me, you are not keen on BBQ food why not try these lovelies out next time. I know I will be popping them on the BBQ this summer for sure. This came about as I was once again looking for a new way to get more fish into our meals. I used a mixture of white and oily fish in this recipe, both worked well. The salsa in this particularly made it for me. Really zingy and it just brings the whole meal together. Make sure you cut your veggies chunkily enough so they can be threaded onto the skewers, but not so chunky that they take forever to cook. Our courgettes were undercooked, fortunately we like crunchy veggies in our house. 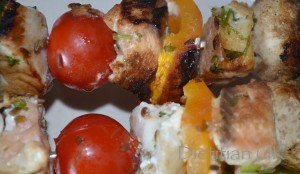 You can make the skewers in advance ready to cook later on, but make sure you do not throw the left over marinade away. Most of the fat in this recipe is the heart healthy monounsaturated form, with a medium amount coming from polyunsaturated fats and just a small amount from saturated fat. The avocado and oily fish provide these heathy fats which are needed by the body and the brain. A fabulous way to encourage the family to eat more fish, omega 3's and monounsaturated fats with fresh flavours and a zing. 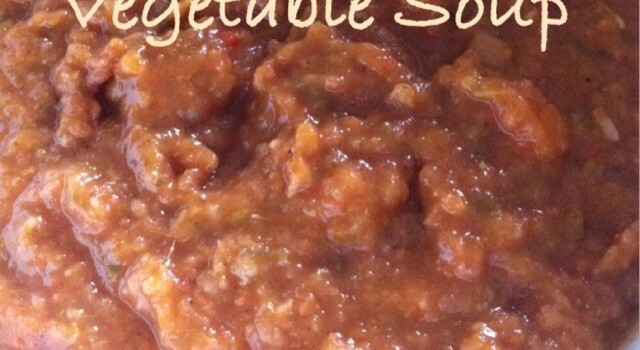 A great heart healthy recipe. Make up the marinade by juicing the limes and mixing all the ingredients together. Cut the fish into cubes and place into the marinade whilst you prepare the other ingredients. Cut the vegetables into chunky pieces. 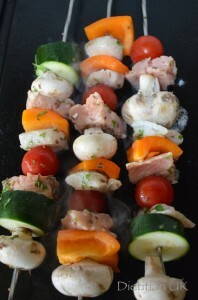 Now thread the vegetables and fish onto skewers, pout over the marinade and put in the fridge until you are ready to cook. Heat a griddle pan or a grill, place the fish skewers on there to cook, turning frequently. They will take about 8 minutes. Meanwhile get the rice cooking. Add the cloves, cumin seeds and tumeric in as it cooks to flavour it. Now peel and chop the avocado into small chunks along with the tomato. Add the juice of half a lime and some pepper. When the rice is cooked pour the leftover marinade from the fish kebabs over and stir. Serve up the rice with the kebabs on top and the salsa on the side. Why you should say NO to diets. Weight loss, that seems to often be the theme for January. Which is all good, but I find it slightly frustrating that the answer people turn to is often jumping onto the next diet craze. Here are my top reasons why not to diet. 1. A short term fix leads to short term weight loss. Most people want to lose weight forever. Most diets don’t result in this, they lead to some weight loss followed by the weight piling back on again. Go for long term lifestyle changes that you are going to stick to for the long haul. 2. Food is to be enjoyed. Diets can be very restrictive and frustrating as well a limiting you socially. Food is a central part of life and socialising so it is important to find an eating plan full of foods you like, love and want to eat. Planning in treats is essential, this helps you feel like you have a bit of the “naughty” foods in your life without going over the top. If they are planned in then you know they are coming and can look forward to them. Eat well 80% of the time and treat yourself 20%,the 80/20 rule. I believe in everything in moderation. 3. Swings and roundabouts instead of slides. Yo-yo dieting leads to your metabolism getting very confused. Instead of swinging from one way of eating to another find a consistent approach to get that weight sliding down steadily. 4. The tortoise wins the race. Remember the tortoise and the hare story? Sometimes slowly but surely is the way to go and that is definitely the case for weight loss. Aim to lose 1-2lbs a week (0.5kg) and no more. It may not sound as dramatic or seem like you are losing the weight the speed you would like but in the long term this will work. Too rapid weight loss usually means you are losing fluid and muscle rather than fat. A lot of the time diets are not based on scientific research but on someones experience, logic and ideas. There has been a lot of researched into weight loss, so why go with someone’s ideas and not the facts? 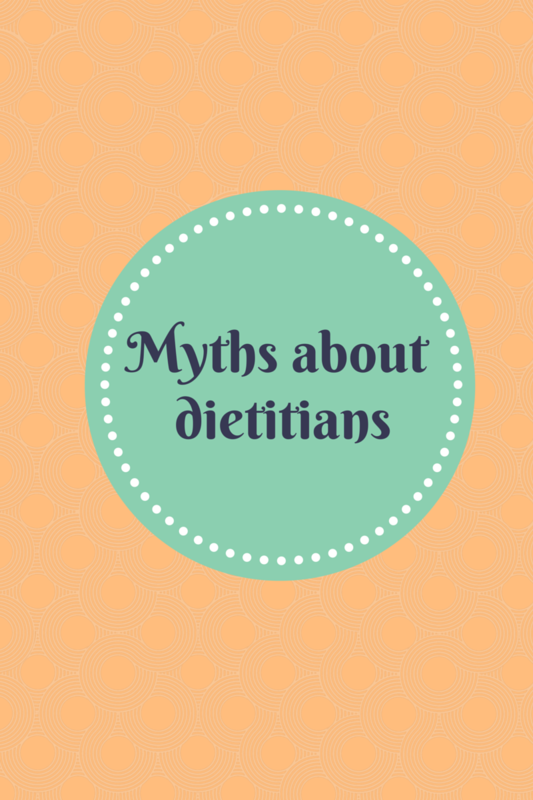 Be careful of your sources, look for a qualified professional – dietitian or registered nutritionist. 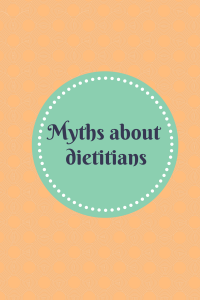 Trust a dietitian to give you evidenced based advice you can believe in. Look out for my next post on HOW to lose weight without dieting and my healthy meal planners that are coming up this month. The weather has turned distinctly chilly, so we’ve turned to soups for our lunches. I love soups as they really are easy to make, they can be an easy way to get vegetables and great nurtitious food into the family and they heat up the insides. This soup was a bit of an experiment, it has a different edge to it with the cinnamon, cumin and lemon. It really does work and makes a fresh, tingly on the tastebuds soup. To make this a complete lunch we ate ours wih rice cakes and finished with a yoghurt. 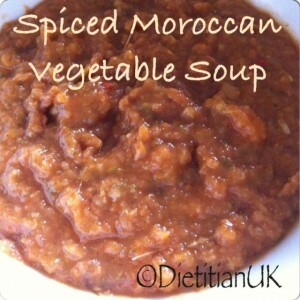 A zingy, spiced vegetable soup inspired by Moroccan flavours, quick, easy, healthy, low fat and packed with goodness. Gently cook the onion, then add the garlic, cinnamon, cumin, chilli and tomato puree. Cook for a couple of minutes. Add the chopped apricpts, lemon zest and lemon juice, stir. 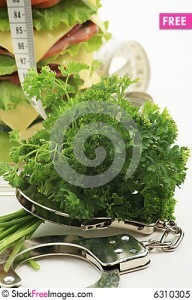 Now add the carrots, greens and stock. Simmer for 20 minutes, then blend. Freelance Dietitian specialising in helping those with Eating Disorders and a Media Spokesperson for the profession.